I was recently asked if I had used this book in the past and how... I had not, even though I owned it, so I thought it would be a good idea to write a blog on it before the summer term when we may want to talk about Paris! This is the story of a girl looking for her cat around Paris. 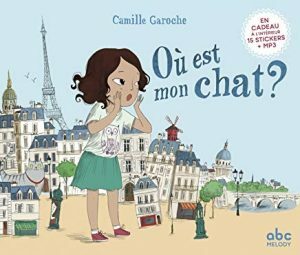 With a small group, at first reading the children could just look for the cat on each double page and say "le chat est là!" when you ask them "Où est le chat?". On second reading, you could point out to the children the famous monuments, for them to repeat their names. You can also use my presentation below. Then each child in the glass could be given a role in the story, on paper and to memorise, including a narrator, and the whole book could be acted out! This story is particularly good if you want to look at Paris with your children, or you are after cultural pointers. There are so many to exploit in this story, at different levels. The children will be learning about Paris and could compare it to their area; they could even draw a street in Paris then their street and talk about the differences and similarities with where Lola lives. You will find some more ideas by clicking here. You can buy the book here at European Schoolshop: it is on special offer as I write! Another fabulous story about Paris is "Un lion à Paris" by Beatrice Alemagna; a beautiful book I will tell you more about another day! What is your favourite area of Paris? Please tell me in the comments!